Avamere has promoted Nicolette Merino to the role of president for its new Ovation division. Ovation is a brand Avamere created for its “micro CCRC” concept earlier this year. Merino joined the Avamere Family of Companies in 2008, and has served as a regional director of operations and vice president of operations for the company’s community-based care portfolio. Overall, she has 26 years of experience in the long-term care industry. As planned, Ovation communities will have 300 independent living, assisted living and memory care apartments. Avamere is currently building Ovation properties in Omaha, Nebraska, and St. George, Utah. Both of those communities are scheduled to open in mid-2020, with more locations forthcoming. The Avamere Family of Companies also announced on Wednesday a reorganization of its executive ranks to remove the separations among its individual entities, allow the sharing of resources and create a post-acute care network. HumanGood has named Dennis Gradillas as its new vice president of sales. Gradillas previously oversaw the senior housing provider’s life plan communities as vice president of operations. 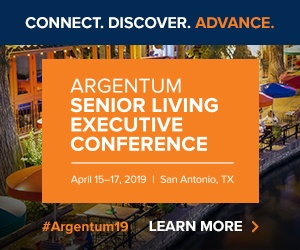 He has more than 20 years of experience in senior living and hospitality, including time spent as executive director of HumanGood’s life plan community in Summerlin, Nevada, Las Ventanas, and as general manager for the Platinum Hotel and Spa in Las Vegas. Solvere Living — the operations division of Solutions Advisors Group — has appointed Jack McCarthy as executive vice president and Jamie Holiefield as vice president for its eastern region. In his new role, McCarthy is tasked with growing the Solvere’s operating platform to balance third-party management, oversee equity earn-in and track acquisition opportunities. He’s also responsible for assembling a Solvere Living board of directors and working within the executive and leadership teams at Solutions Advisors Group. McCarthy has in the past worked as senior vice president of sales and marketing, and COO for Benchmark Senior Living. Most recently, he worked as senior vice president of senior housing real Estate for WMD Asset Management. Holiefield, meanwhile, will direct operation of Solvere Living-managed communities in the company’s eastern region. Specifically, she is tasked with managing team members, budget, occupancy, regulatory compliance and client satisfaction. Holiefield most recently served as regional director of operations for Harbor Retirement Associates. Solvere currently operates 12 communities in Florida, New York, New Jersey, Texas, Maryland, Virginia and Oklahoma. Watercrest Senior Living Group has welcomed Johnita Jackson as RN clinical specialist. In this newly created role, Jackson will lead the resident wellness program, mentor and train resident wellness directors and conduct clinical site visits for all of Watercrest Senior Living’s communities. She will also help roll out new clinical programs. Jackson previously worked as health and wellness director of a 175-bed assisted living community. East Ridge at Cutler Bay, a not-for-profit life plan retirement community in Cutler Bay, Florida, recently named Mary Scott Russell as its new director of marketing. In her new role, Russell help the community develop marketing strategies, expand current relationships and bolster ties with civic, cultural, and health-related organizations and companies throughout the area. Russel has a previous background as commissioner, vice-mayor, and Mayor of the City of South Miami. She also has chaired the Informed Families South Miami Coalition and most recently worked as President and CEO of the ChamberSOUTH chamber of commerce. Senior Star has named executive directors for two of its communities in Cincinnati and in the state of Illinois. Steve Slayton is now executive director of The Kenwood by Senior Star, a senior living community in Cincinnati. Slayton previously worked as district director of operations for Brookdale Senior Living, a role that tasked him with managing several communities in Texas, Arizona, Oklahoma and Kansas. He also previously managed Emeritus communities in North Texas and served as an executive director of a geriatrics psychiatric hospital in Dallas. Senior Star also announced the appointment of Michael Maggiore as executive director of Senior Star at Weber Place, a senior living community in Romeoville, Illinois. Among Maggiroe’s goals as executive director are incorporating more educational and artistic programming, expanding the culinary offerings and exploring new technologies for memory care residents at the community. Maggiore most recently worked as the executive director of an assisted living and memory support community in Grayslake, Illinois. Campo Felice, an active adult community in Fort Myers, Florida, has named Tara O’Sullivan as its executive director. In her new role, O’Sullivan will handle the community’s day-to-day leadership and management, including leasing, maintenance and housekeeping, activities, security, transportation, spa and salon, dining services and concierge and valet services. She most recently worked as executive director for a Discovery Senior Living community in Fort Myers, and before that worked as vice president of operations for Erickson Living. The Legacy Senior Communities has announced election of Jerry Rasansky as the new chair of its board of trustees. Rasansky has worked with the organization in the past, including chairing the board for The Legacy Preston Hollow — Dallas Home for Jewish Aged. The Legacy Senior Communities is a growing organization, having just started work for The Legacy Midtown Park, a continuing care retirement community (CCRC) in Dallas. It also recently completed a formal strategic planning series meant to affirm its mission and values and define goals and strategies over the next five years. The Laramar Group, a national real estate investment and property management company that deals in part with senior housing, has named Peggy Panzer to the role of vice president of business development. Panzer is tasked with finding new business, driving positive financial performance and striking new relationships with executives, clients and partners.